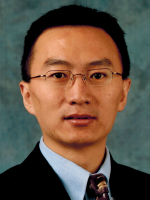 Dr. Moo-Yeal Lee, an associate professor in the Department of Chemical and Biomedical Engineering (CBE), has been awarded funding by the Colgate-Palmolive Company to evaluate the effectiveness of some of the company’s products. The twelve month award provides $80,000 in funding to Dr. Lee’s lab to perform the work. The research will utilize a 384-pillar and well plate testing platform developed by Dr. Lee that contains bioprinted microbials to create biomimetic microenvironments for predictive assessment of antimicrobial efficacy. The pillar and well plate design allows a large number of tests to be efficiently completed using high precision, robotic equipment. 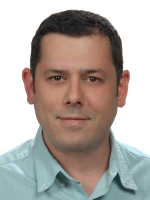 Dr. Umut Celiker joined Cleveland State University in August 2017 as an assistant professor in the Department of Finance. He received his Ph.D. from the Virginia Polytechnic Institute and State University (Virginia Tech). Prior to joining CSU, he worked as an assistant professor of finance in Virginia Tech’s Pamplin College of Business and Ozyegin University in Istanbul, Turkey. Dr. Celiker’s current research interests lie in the field of empirical asset pricing with a focus on stock return anomalies, hedge funds, and financial analysts. His work has been presented at both national and international conferences, including the Financial Management Association, European Financial Management, and Eastern Finance Association. Dr. Celiker’s publications have appeared in leading finance journals such as the Journal of Banking and Finance and Accounting and Finance. He currently teaches undergraduate level finance and investment courses, as well as a doctoral level investment course. 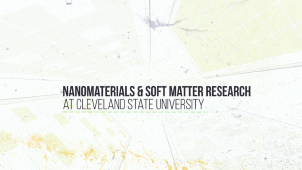 This month, we are highlighting three researchers at Cleveland State who are on the cutting edge of coatings and nanomaterial research. Dr. Jessica Bickel (Department of Physics) and Drs. Geyou Ao and Chris Wirth (both in the Department of Chemical and Biomedical Engineering) discuss the research that they and their students are performing, and the potential impact that their innovations will have on manufacturing and improving product performance. 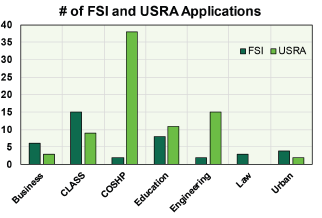 This year’s Faculty Scholarship Initiative (FSI) and Undergraduate Summer Research Award (USRA) programs not only set records for the number of applications submitted (a combined total of 118), but included proposals from 7 academic colleges and 24 different departments. The record number of submissions speaks to the growing research and scholarship enterprise at the University. Thanks again to all who applied - funding decisions will be announced by April 1. 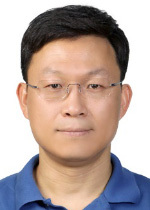 Dr. Guowei Jian is a professor and Graduate Director in the School of Communication. He specializes in the area of organizational communication and leadership. One of his current research projects examines the communicative practices of regulatory agencies in their effort to ensure reliability and security in the U.S. bulk electric power industry. In addition to his research, Dr. Jian provides consulting and training services to organizations in our community on the subject of organizational culture and communication. Dr. Jian received his Ph.D. in communication from the University of Colorado, Boulder. He has authored and co-authored over forty peer-reviewed journal articles, book chapters, and encyclopedia articles. In 2018, his research paper “Knowing Others is Wisdom: Theorizing Empathetic Leadership” won a Top Three Paper Award in the organizational communication division of the National Communication Association. He has served on the editorial board of several journals, including Human Relations, Management Communication Quarterly, Journal of Applied Communication Research, and Western Journal of Communication. 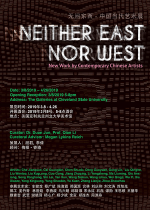 Qian Li, a professor in the Department of Art and Design, is curating two new exhibits at The Galleries at CSU: Neither East nor West: New Work by Contemporary Chinese Artists and the International Video and Animation Exhibition. Prof. Li is an artist and designer who works with video, painting, animation and interactive installations. Featuring the works of over twenty-five artists, the exhibits will be on display through April 26, with viewing hours on Tuesday, Thursday, Friday, and Saturday. The Galleries at CSU are located at 1307 Euclid Avenue in the historic Cowell and Hubbard building. America’s Seed Fund powered by the National Science Foundation (NSF) is piloting changes to the Small Business Innovation Research/Small Business Technology Transfer (SBIR/STTR) proposal submission process. Starting in March 2019, startups or entrepreneurs who submit a three-page Project Pitch will know within three weeks if they are a good fit for the SBIR/STTR program’s objectives of supporting innovative technologies that show promise of commercial and/or societal impact and involve technical risk. Startups or entrepreneurs can submit a Project Pitch at any time during the pilot, which runs through December 2019. More details about the NSF’s new process are available at seedfund.nsf.gov. Cleveland State University is joining with Squire Patton Boggs and other Northeast Ohio organizations to host the Venture Law Meetup â€“ Donuts & Coffee series. This monthly informational series aims to equip executive officers and founders of new start-ups with the knowledge and tools needed to navigate the various aspects of launching and growing a new venture. The next event in the series is Friday, April 12, 2019. This month’s topic is “Enhancing Capabilities and Accelerating Pace to Market.” Squire Patton Boggs attorney Leah Brownlee will be joined by the Cleveland Clinic Innovations team to discuss. 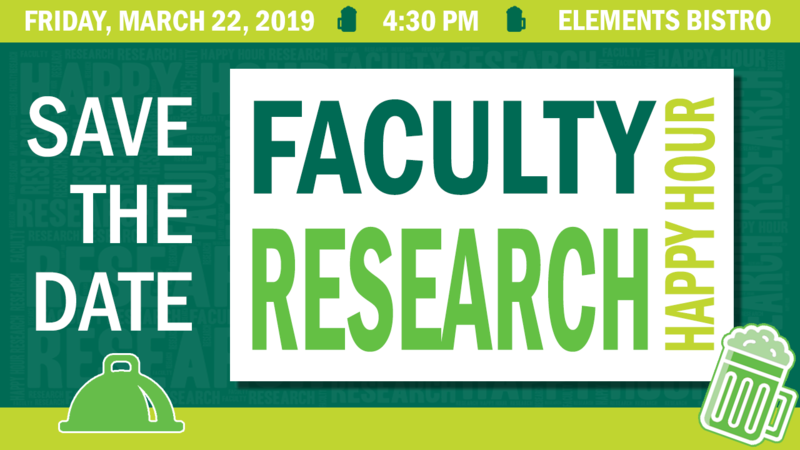 The Faculty Research Happy Hour Returns March 22! There is no research collaboration without conversation. The Faculty Research Happy Hour is intended to provide faculty members with a break from their offices and computer screens, and an opportunity to meet with colleagues in a relaxed, informal atmosphere. The Happy Hour is scheduled for March 22 at 4:30 pm at Elements Bistro. The Office of Research created the Multidisciplinary Research Panel Series to enhance collaboration across the University that will creatively and meaningfully address the needs of our community and our society. All panels are held in PH-104, and the full schedule can be found here. Cleveland State University received a new $62,000 grant from the Burton D. Morgan Foundation to support entrepreneurship programming for students in 2019 and 2020. Colette Hart, director of the Centers for Outreach and Engagement in the Ahuja College of Business, announced the award during the February dedication of the new Weston Ideation Lab. Dr. Shereen Naser, an assistant professor in the Department of Psychology, was recently awarded $49,629 over two years by the William T. Grant Foundation for her project titled, "Using an integrated data-based referral framework to reduce disproportionality in school discipline referrals and increase access to mental health prevention and intervention services for marginalized youth." Dr. Naser is collaborating on this project with Dr. Kristy Brann from Miami University in Oxford, Ohio. 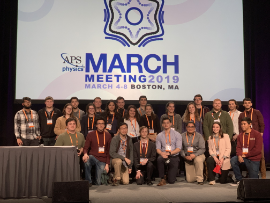 CSU students, faculty, and alumni left their mark at the 2019 American Physical Society (APS) March Meeting in Boston, Massachusetts. The APS March Meeting is the primary and largest annual meeting of the physics community in the US. Among the highlights, December 2018 CSU graduate Joshua Clark won the top prize in the undergraduate poster session for his project, “Optimization of Serpentine Micromixers with Non-Rectangular Cross-Sections.” Joshua’s advisors for the research were Drs. Petru Fodor and Chandra Kothapalli. 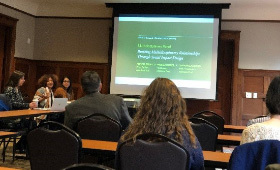 Four students who participated in the 2018 NSF-funded Soft Matter Research Experiences for Undergraduates (REU) site at CSU also presented. They included Jacob Adamczyk (advised by Drs. Miron Kaufman and Kiril Streletzky), Joshua Clark, Ty Naquin (advised by Dr. Nolan Holland and Dr. Streletzky), and Niksa Praljak (advised by Dr. Andrew Resnick). Samantha Tietjen presented a poster for her Undergraduate Summer Research Award (USRA) and Undergraduate Research Award (URA) project. She was advised by Dr. Streletzky. Congratulations to all! Please share with us important news or updates on your research, scholarly, or creative activities. Updates may be related to a paper that has been accepted for publication in a high-impact journal, a book you've just published, your work that will be exhibited at a prominent institution, or other updates you wish to share with our office. Send details to j.yard@csuohio.edu and d.j.simon@csuohio.edu.